It’s time again to choose your favorite tunes of Tic Tac Trance! You can now vote for up to 3 of your favorite tracks of the show. The winner(s) will be played in the next episode again! Unlike other shows, the winner(s) can only be part of the vote one time, that means, it will be removed from the vote options of the next episode. What are your favorites of Tic Tac Trance #013? Happy new year to everyone! 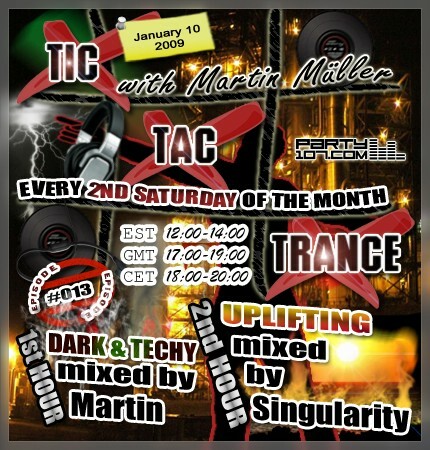 For the 13th episode of Tic Tac Trance on January 10 I decided to create a harsh separation in trance styles. Are you prepared for a different approach into 2009? I have to admit it’s really unusual for me to provide such a dark and techy mix for the first hour of the show, but don’t worry, there will also be a very uplifting set by my guest Singularity in the second hour. He will play some of his lastest productions and remixes, but also some other tunes aswell. Furthermore the webvote will be back again, as always you will be able to vote for up to 3 of your favorite tunes of the show!